Paul Hollywood. The man of the moment. Overnight success many years in the making. I remember watching him opposite Jeni Barnett on Great Food Live a decade ago and he was clearly a font of all bready knowledge. His patented double-claw-rolling-out-dough technique was well practiced even back then. Post Bake-Off, he is fronting the most appropriately titled vehicle for him: Bread . Blogs are awash with how decent his recipes are; and his myth-busting tips are pure gold. Such as: you don’t need warm water for yeast to prove dough. In fact tap-cold water is better as the slower growth will develop the flavour. Genius. I have a handy recipe for garlic bread which I really like but it’s a bit more suited to a barbecue. His garlic bread involves folding roasted garlic cloves into baguette dough, and as you might imagine this creates the most amazing smell whilst baking. Mine didn’t even get the chance to get bathed in mozzarella like his before being scoffed; maybe next time! The garlic bread recipe is over on the BBC site and well worth trying. 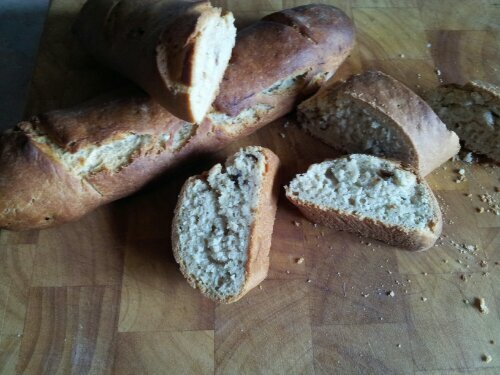 This entry was posted in bread, food, garlic and tagged Paul Hollywood on April 7, 2013 by Gary. Shock, horror! 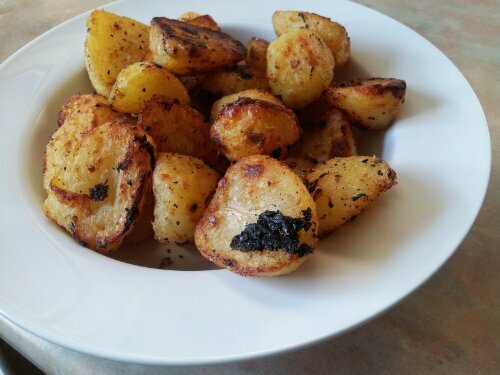 Another roast potato recipe on this blog. What an anomaly. 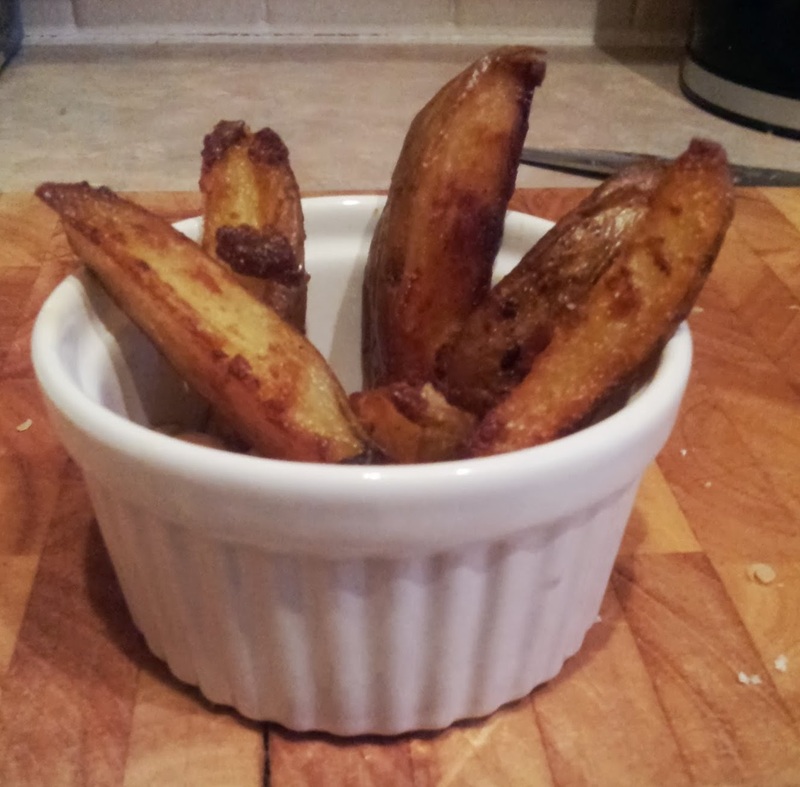 Of course it isn’t, I’ve got roast potato recipes here, here and here for starters. 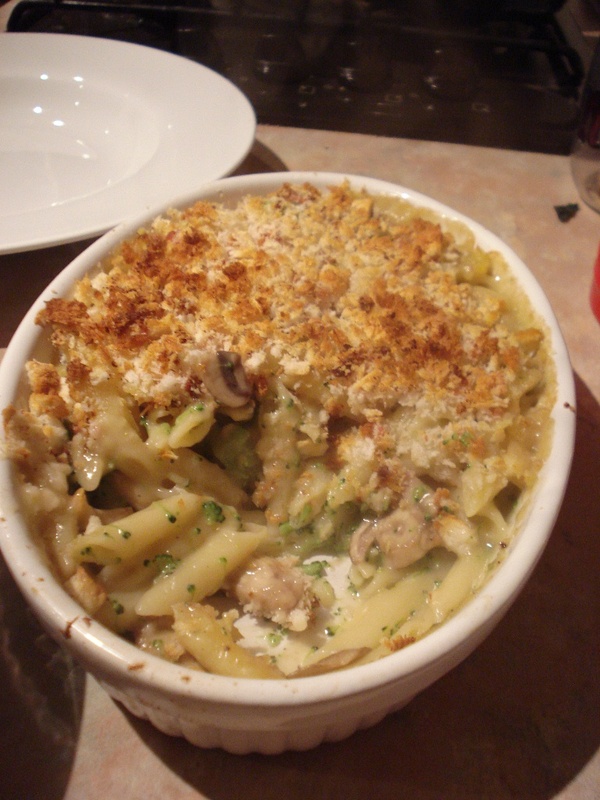 But this was another twist, derived from cooking Heston’s perfect chicken (again). The chicken there is treated with a boozy butter baste. I’d gone a bit crazy and made too much, so decided to slather it on the potatoes. And with a little lemon and garlic to really boost those flavours I think it’s a great alternative! Any white wine would work, but I had some Pinot Grigio a-wastin’ so that’s what I used. You want something sweet-ish here I think, a dry wine could turn out bitter with such fierce roasting. Preheat your oven to 200°C. Simmer the potatoes in salted water until really tender. Drain and allow to steam off excess water a little while you prepare the baste. Put a heavy baking tray in the oven to preheat. Add the wine, butter and thyme to a saucepan and bring to the boil, then immediately remove from the heat. Toss the potatoes in the buttery wine and tip on to the baking tray and roast. After 20 mins, peel the lemon zest in strips and add to the baking tray along with the garlic. Toss the potatoes well to coat. If it’s looking a bit dry add a dash of oil. Roast for a further 20 mins, or until the potatoes are very crisp. Season with salt and pepper before serving. 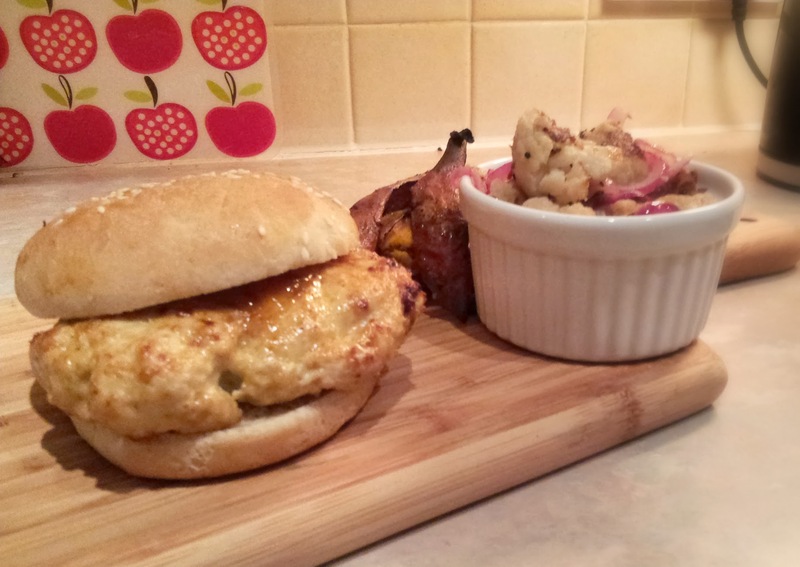 This entry was posted in food, garlic, lemon, potatoes, wine on November 25, 2012 by Gary. When you’re trying to cook to a budget potato gnocchi is a great choice: just a few of them go a long way. Their bland nature makes them a great foil for any strong flavours. I’m a big fan of roasting vegetables so this is a super combo. This is warming, filling, and doesn’t feel frugal! There’s lots going on with sharp, salty cheese; soft, toothsome gnocchi and rich, sweet roasted red peppers. Preheat the oven on to 180°C. Put the peppers and garlic on a baking tray, drizzle with oil and pop in the oven for 30 minutes to soften and char. When soft to the touch mash the squeeze the garlic out of their skins and mash together the peppers with a fork, adding some salt and pepper. Get a large pan of salted water on to boil. Add the gnocchi and boil according to the packet instructions. Drain and combine with the pepper sauce, then stir the feta and rocket through. Serve immediately. 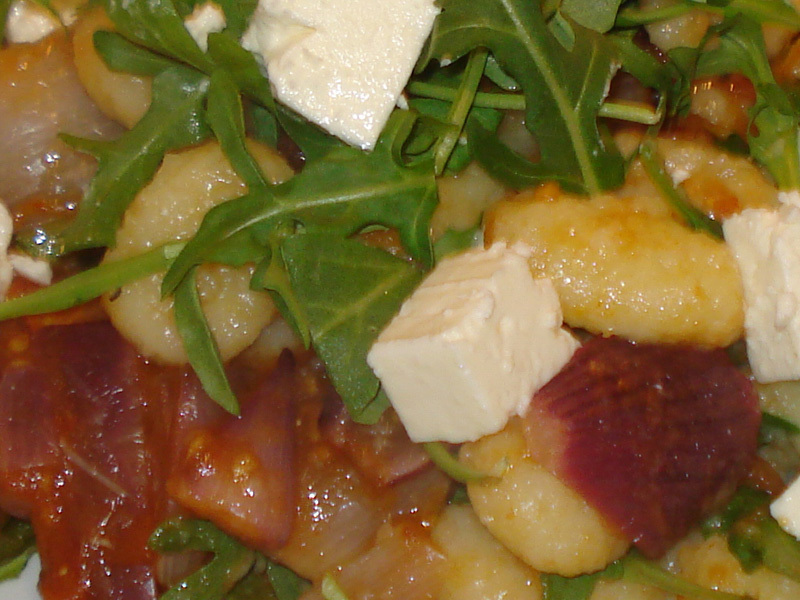 This entry was posted in feta, food, garlic, gnocchi, peppers, rocket on October 8, 2012 by Gary.